The compressible and non-expanding (CNE) fluid model was applied to the numerical simulation of the high-speed impact of the regolith-like granular material. Assuming the different speeds of sound for the irreversible compression and reversible elastic unload/recompression processes, this model can describe the following features: (1) high-density fluid remains after all the motion stops, (2) the absence of the fluid, that is, the vacuum is allowed to exist, and (3) the crack can be formed in place of the expansion wave. The fundamental solutions of the Riemann problem, which are necessary for Godunov’s method, are composed of the shock waves in the elastic process, the shock waves with the irreversible compression, the contact discontinuities, and the contact surfaces with the vacuum. The shock wave in the elastic process appears as the precursor to the irreversible compression. The numerical results of the one-dimensional regolith-on-regolith impact problems revealed that the phenomena are divided into the penetration stage and the bounce back stage. The ejection velocity decreases with the increase in the speed of sound for the unload process. 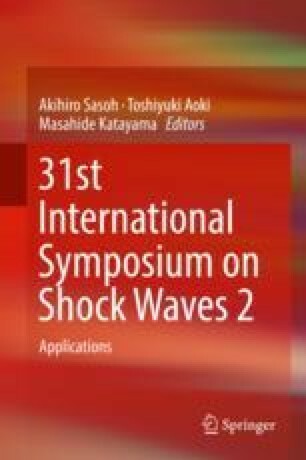 In the two-dimensional oblique shock wave problems, the two-stage shock wave structure composed of the precursor wave and the irreversible compression wave was numerically simulated, and the relation between the wedge angle and the wave angles was obtained. This work is supported by Grant-in-Aid for Scientific Research (B) No. 16H04585 of Japan Society for the Promotion of Science.